IB math classes in high school could give you college credit or prepare you for a job in today's global marketplace. According to the International Baccalaureate Society website, the goal of the International Baccalaureate program is to develop “internationally minded young people who are well prepared for the challenges of life in the 21st century and able to contribute to creating a better, more peaceful world.” The IB diploma program offers students a chance to challenge themselves with academic subjects that have a multicultural, worldly perspective. The traditional IB diploma program is offered to high school juniors and seniors, while some schools offer IB classes starting in elementary school and middle school. 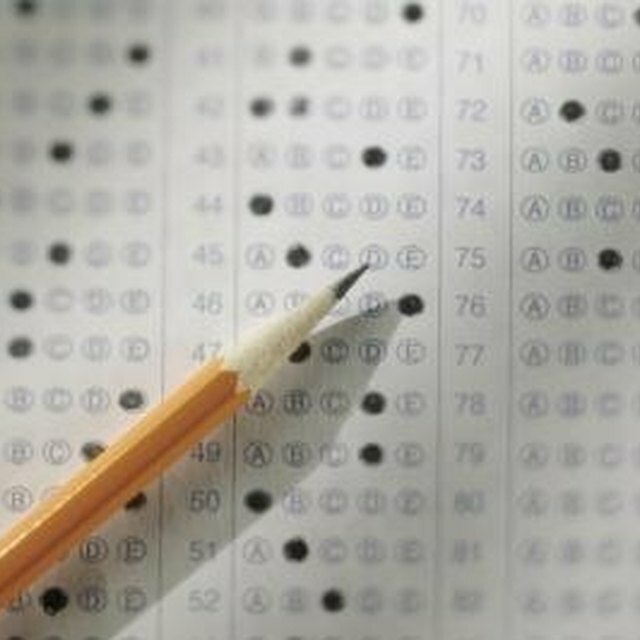 High school IB classes culminate in an exam that is similar to Advanced Placement exams, which offer college credit. The IB Diploma Program was developed in 1968 to foster a global awareness and multicultural acceptance. IB math is one of the six subject groups in the IB Diploma Program for high school juniors and seniors. Required subject areas other than math in the IB Diploma Program include language, second language, the social sciences, the arts and the experimental sciences. All subjects, including math, are taught with an appreciation for the multicultural and historical perspectives of the subject. The IB diploma program has two kinds of IB math tracts: Standard and advanced. 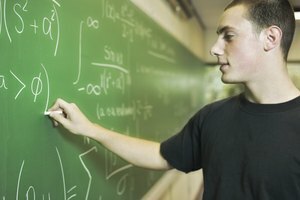 IB Standard-level math teaches 150 hours of instruction on subjects that include algebra, functions, equations, trigonometry, vectors, statistics and calculus. Required assessments include two papers with short and extended response questions and a portfolio with two pieces of work that details math applications, including investigation and modeling. 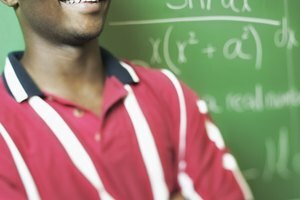 Students who are particularly good in math and want to major in the subject in college, or in a subject that requires extensive math skills, should take Advanced IB Math. Advanced IB Math students get 250 hours of instruction on higher levels of the same group of subjects as standard math students. Many universities recognize that the IB two-year math program is equivalent to college-level work. Students who receive a 5 out of 7 points on the IB math exam may be able to receive college credit, much like students who pass an Advanced Placement exam can receive college credit for it. 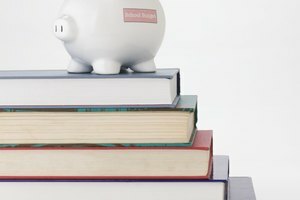 Each university has its own policies on accepting IB units for college credits, and there are some discrepancies between those who pass standard IB math exams and advanced IB math exams. It is best to check with the college you are interested in for more specific information about getting college credits for IB math classes. According to U.S. News and World Report, the International Baccalaureate diploma program is becoming an essential part of many U.S. high schools, due to a growing demand for a global skill-set in today’s economy. IB math teaches critical thinking skills using a solid base of mathematical knowledge to solve realistic problems. The goal of IB math is to teach students how to apply the knowledge and concepts they learn in class to other subjects in the IB program, such as economics, chemistry, psychology and business. IB Math teaches critical thinking and emphasizes logic and creative problem solving, which will prepare you for more advanced university-level classes such as statistics, calculus for business and life sciences. The International Baccalaureate website explains in its course description for IB Math that the teaching method includes an introduction of critical math concepts “through the development of mathematical techniques in a way that emphasizes subject comprehension rather than mathematical rigor.” High school students who want to go into career fields that require higher-level math skills, such as those in economics, engineering, business, or the physical, life and social sciences, will benefit from the logic and processes taught in IB Math. According to the International Baccalaureate website, all schools that want to be considered IB World Schools and offer the IB diploma program must first be authorized, after careful scrutiny by the organization and continue to be carefully monitored for quality assurance. Because many prestigious universities respect the IB program, graduating with an IB diploma and taking IB classes is a considerable advantage on a college application. IB Math, along with all IB curriculum, is assessed through an end-of-the-year exam that is comparable to the Advanced Placement tests given by the College Board. 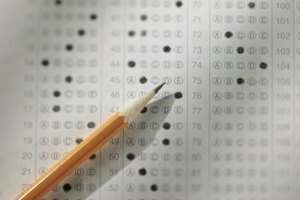 Student performance on these tests is measured against the high standards set by the IB Board, instead of being judged based on how well other students do on the same test. Students are assessed not only on how well they answered math questions, but on how they came up with those answers, using appropriate terms, technical skills, strategies, patterns and devices. Students must also create a portfolio that shows their investigative thought processes in solving real-world problems. The portfolio is worth 20 percent of the final grade on the assessment, while two papers answering short and extended questions, given 1.5 hours for each, are worth 80 percent of the IB math exam grade. 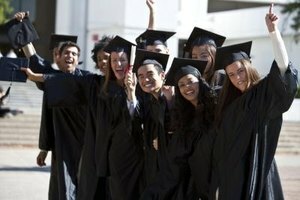 College Data: What Is the International Baccalaureate? International Baccalaureate: Who Are We? Crowe, Bonnie. "Why Take IB Math?" Synonym, https://classroom.synonym.com/ib-math-15284.html. 26 September 2017.